After Kate Middleton announced the big news that she, and Prince William are expecting their third child, all the public eyes are turned at her. And, there is so much to be seen, because she is one of the most stylish women ever seen in the world. And with her maternity she looks even better. So, she has become inspiration for so many future mums to be from all over the world. No matters the occasion, she always looks beautiful and royal. With her good taste all her maternity outfits has been followed and copied from thousands of women from the whole world. If you want to look chic and modern during your pregnancy, such as she does, then don’t wait and start learning from the one who does it the best. We have selected some of the most stylish maternity looks of Kate Middleton, that we recommend you to wear this winter. We are sure that you will enjoy looking any of it, and can you ever imagine the feeling of wearing any of them? 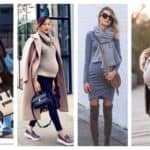 We are sure that you will get some inspiration from her outfits and that you will pass your pregnancy looking as beautiful, modern and chic as you did even before your pregnancy. Stay classy and modern at the same time with this collection of the best Kate Middleton’s maternity looks. Scroll down the page and let the magic of her stylish outfits fulfill the most beautiful period of every woman’s life.